Today we're going to go over the changes Sage has made to make the Inventory Advisor menus easier to work with when using touch devices like iPads, tablets and smart phones. Most of the menus now have a secondary feature to the button. By clicking or tapping the button the user can access the drop-down menu. The drop-down menu can close by either choosing one of the options, or clicking or touching somewhere else on the screen. Clicking or touching the main part of the menu will still take you back to the primary action of the menu. This has not changed. There is also new some graphical information added to the menus. This makes it quicker and easier to compare the different locations. In the Stock holding column you can now see the actual and model values all in one column, and it includes a bar chart to easily compare and contrast stock holdings of the various locations. Similarly the Fill rate column now shows the achieved and target fill rate in one column, with a bar chart to easily compare achieved fill rates of the various locations. 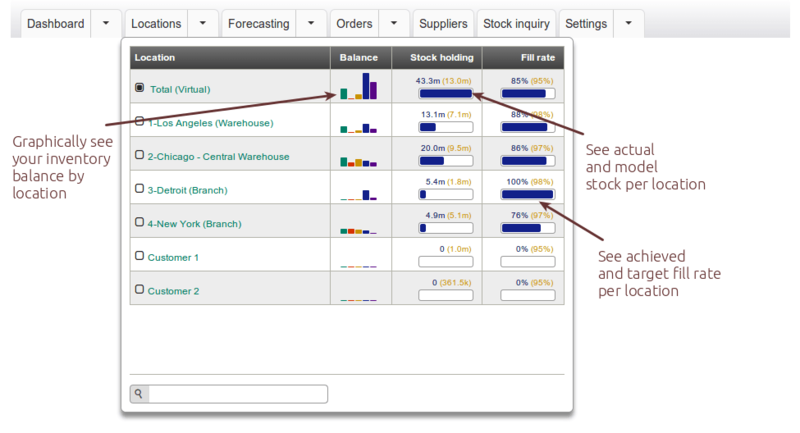 If you have any questions on the new menus in Sage Inventory Advisor please contact Equation Technologies today.